Our clients purchased a 6,126 square foot home built in 2002 that required quite a bit of updating. Their wish was an open floor plan and an interior design with an elegant, Western flair. The project started with removing the flooring, fireplaces, and a wall separating the great room from the family room. After demolition was complete, we put the house back together with wood and tile lattice flooring, limestone fireplaces, a water feature, and a hand-carved wood bar. The homeowner wanted some sparkle in the design, so she added unique metal-look and glass tile to different areas of the house. They added light fixtures with glass accents, installed LED recessed cans, LED cloud fixtures, and LED accent lighting. 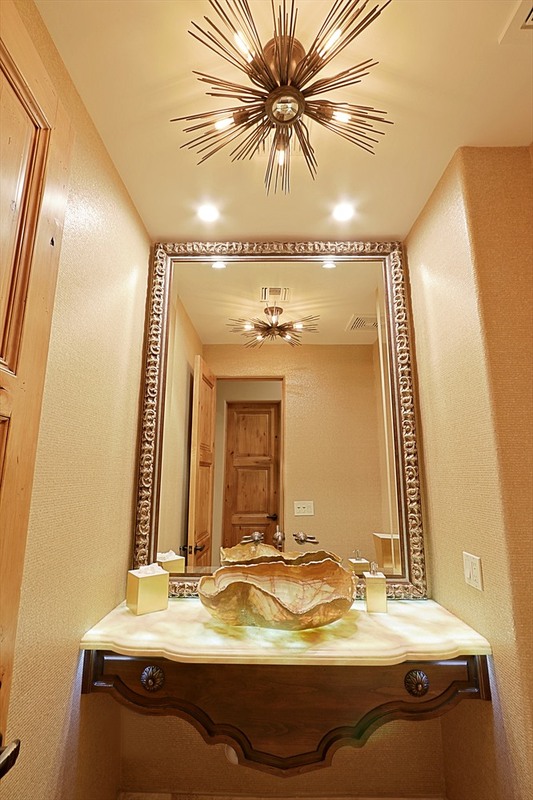 A few of the special focal points in the house are the exotic granite counters at the horseshoe bar and master bathroom and the powder bath, which has a floating vanity with back lighting and custom wall covering. The homeowners said that the house turned out better than their expectations, and they look forward to spending more time in Arizona!